Free twilight summer concerts have become summertime traditions in neighborhoods throughout San Diego County. They’re an opportunity for visitors, locals and their families to socialize, picnic, enjoy music together – and maybe even dance as the sun sets on another perfect San Diego summer day. The Point Loma Summer Concert Series opens July 11 with the Mighty Untouchables and continues on consecutive Fridays through August 8 when Detroit Underground takes the stage. Shows run 5:30 to 8:30 PM. Pack a picnic or buy food at the venue. Bring blankets, lawn chairs and Frisbees to Point Loma Park, 1049 Catalina Blvd. Pacific Beach Concerts on the Green are set for Sundays July 20 through August 10. Shows run from 4:00 to 6:30 PM at Kate Sessions Park (Lamont Street, just north of Beryl). Bring your own food and drink. Mission Hills Summer Concerts in Pioneer Park series opens June 20 at Pioneer Park and continues on consecutive Fridays through August 22. Pioneer Park is at 1425 Washington Place. Balboa Park’s Twilight in the Park concert series kicks off at 6:15 PM June 17 and continues on Tuesdays, Wednesdays and Thursdays through Aug. 28 at the park’s Spreckels Organ Pavilion. The hour-long shows feature everything from classical music to R&B. Enjoy organ music? The International Summer Organ Festival features top organists from around the world. 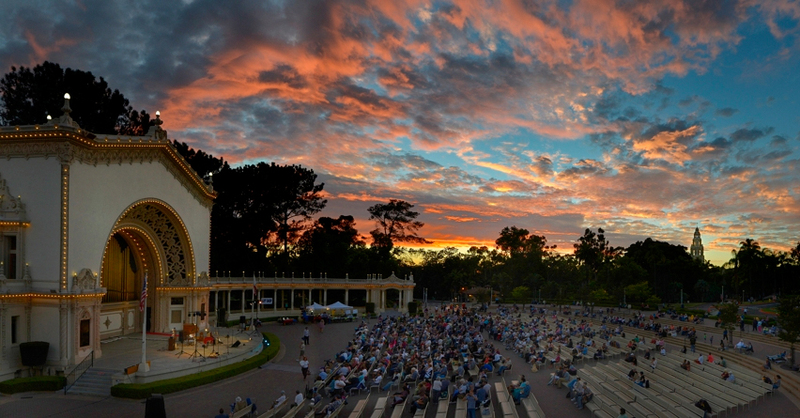 Showtime is 7:30 – 9:30 PM on Mondays, June 23 through Aug. 25, at Balboa Park’s Spreckels Organ Pavilion. The Bird Park Concert Series in North Park opens June 14 with the Bill Magee Blues Band. More concerts are scheduled June 28 (folk), July 12 (indie rock), July 26 (country) and August 9 (Zydeco). All shows run 5:30 to 7:30 PM. Bird Park is at 28th and Thorn streets. Coronado’s Promenade Summer Concert Series series is set for 6:00 PM on Sundays, through September 7, at Spreckels Park, 7th and Orange. Families (but no dogs) are welcome to picnic during the 90-minute shows. Del Mar’s Summer Twilight Concerts are set for Powerhouse Park, overlooking the Pacific, at 1600 Coast Blvd. The series begins June 17 with Rockola, followed by Back to the Garden on July 1, the Heroes on July 22, Haute Chile on August 12 and Sully and the Blue Eyed Soul Band on September 7. Show time is 7:00 PM, with pre-show entertainment beginning at 6:00 PM. Carlsbad’s TGIF Concerts in the Park is staged at four community parks. The 29th season opens at Stagecoach Park (3420 Camino de los Coches), with concerts on June 27, July 4. The party moves to Alga Norte Community Park (6565 Alicante Road) for concerts on July 11 and 18. Then it’s on to Poinsettia Park (6600 Hidden Valley Road) for concerts on July 25, August 1 and 8. The season closes at Calavera Hills Park (2997 Glasgow Drive) with concerts on Aug. 15 and 22. Showtime is 6:00 to 8:00 PM. Wear your dancing shoes. El Cajon’s Dinner & a Concert series is set for 6:00 to 8:00 PM Fridays through September 26 on the Prescott Promenade near East Main Street and Rea Avenue in downtown El Cajon. The family oriented venue is smoke-, alcohol- and dog-free. No need to pack a picnic; about a dozen restaurants edge the promenade, offering on-the-spot dining or picnics to go. Santee’s Free Summer Concerts are scheduled 6:30 to 8:30 PM on Thursdays, June 19 through August 28. (except July 3) at Town Center Community Park East, 550 Park Center Drive in Santee. The Catillacs will open the series. Picnics are welcome, but know that food trucks rally nearby. Did we miss a free summer concert series in San Diego? Let us know in the comments below. This entry was posted in Arts & Culture, San Diego Events and tagged balboa park, coronado, downtown, east county, mission bay and beaches, north county coastal, Point Loma by Alison. Bookmark the permalink. I’m a junkie. Addicted to travel. Logged 15 years as Travel Editor at the San Diego Union-Tribune – a labor of love. But always appreciate coming home to my favorite city: San Diego. My newest labor of love is an app – San Diego Essential Guide – a tool that lets me share with other travelers what I love most about my hometown. I’d meet girlfriends at South Mission for a low-tide walk along the ocean front to Pacific Beach. Before heading back, we’d hit a boardwalk restaurant for an eggs Benedict breakfast. We’d spend the afternoon at La Jolla Shores with our boogie boards – sun and fun in 72-degree-plus waves. I’d meet my husband for a sunset picnic on a grassy oceanfront bluff at Coast Boulevard Park. We’d end up at Humphreys Backstage Live on Shelter Island, dancing the night away. Can’t think of anyplace I wouldn’t want to be seen in San Diego – except maybe Lindbergh Field, if it would help me speed through security and avoid the body scanner. Do you prefer burgers and beer or linguini and red wine? Dad was a commercial fisherman, so I’m spoiled. Give me barely seared ahi, fresh crab or a fish taco. What’s your favorite San Diego outdoor activity? Fishing – it’s in my blood. But I’m happy doing anything where I can smell saltwater: paragliding from Torrey Pines, kayaking the La Jolla Ecological Reserve, riding my boogie board, picnicking on the beach, chillin’ at a Summer Pops concert. Latest music purchases for my iPod/MP3 player? I’m downloading more apps than music these days. My iPod is full of funky Old School stuff – the best of MJ, Gap Band, Gnarls Barkley, Cameo, Hammer and lots of old Motown sounds: Temptations, Four Tops, The Miracles.